As we hit the main North-South Expressway in Malaysia, I look at my watch. It’s only 11 in the morning. We have just managed to clear Singapore -Malaysia international border checkpoints, in barely 10 minutes. This is something unbelievable because usually at immigration checkpoints, one encounters long queues and delays. To avoid traffic congestion, we had selected the Tuas border crossing. That idea apparently worked, because when we reached the Singapore immigration checkpoint, there were only few cars ahead of us in the line. To cross this international border is fairly easy. First you park your car near the Singapore immigration checkpoint window. Hand in your passports and relax. Passports are returned back to you in few minutes. Then you drive on to a bridge in a NO-Man’s land. After crossing it, park your car again near Malaysia immigration check point. Passport handing over procedure repeated again and you are through. The customs officers in Malaysia merely waved our car to go ahead. This is understandable, because prices of goods in Singapore, being so much on higher side, no one would be really interested in carrying any stuff across the border. I had traveled on this highway, seven or eight years back. I somehow had in my memory that this highway to be very wide. This time, I find it to be quite modest, just 2 lanes wide either way. Since traffic is not much at this hour, we manage to maintain a good speed just below official limit of 110 kilometers per hour. The toll collecting gates on the highway have been modernized though. You can buy cash cards in Singapore and then just touch the card at the toll gate on a sensor box. Barricade in front of you lifts up and a nearby board tells you, how much money is still left on you card. Pretty efficient, I thought! After a couple of hours of a smooth ride on this expressway, we see the eagerly anticipated road sign of ‘Ayer Keroh’ exit being 1 kilometer ahead. It takes only few minutes to take the exit and get through the toll gate. We are now on a medium sized small town road complete with traffic lights, lane markers and road dividers. Traffic appears heavy but we manage to crawl along. Most of the roads except few main roads are marked as one way. That may be the reason of our going through smoothly in spite of heavy traffic. Another half an hour and we are in the hotel lobby. We reach the port city of Malacca. As I roam about this place, I am acutely aware, that the geography and the history of last five or six hundred years is imbibed in every nook and corner here. and remains just inseparable from the present. I can not sort out or label areas, as historical and contemporary or modern. A structure, which at the best can be described as a sixteenth century ruin, worth keeping in a museum, stands just opposite a modern gleaming mall with eateries selling pizza and hot dogs. The town square itself is at least four hundred years old. There is no escaping from history, if I want to really appreciate and enjoy Malacca sites and I am not complaining at all. Malacca is located some two hundred kilometers north of Singapore . 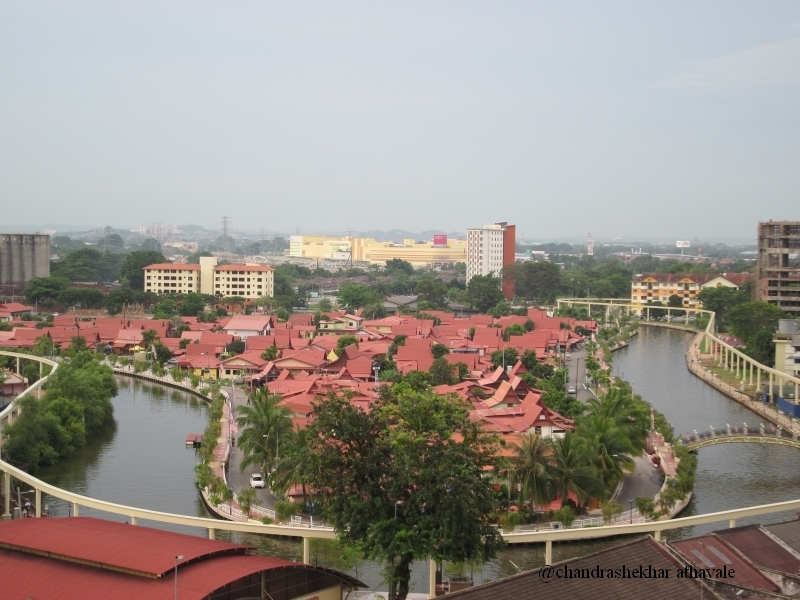 The city is the capital of State of Malacca within federal Malaysia. What makes Malacca so special is the narrow patch of sea along its shoreline. This funnel shaped narrow strip of Sea, called straits of Malacca, is sandwiched between Malaysian coast line on the eastern side and Indonesian island of Sumatra on the western side. In fact, at the narrowest part, which happens to be located near the city of Malacca, the straits are just a few kilometers wide. What makes the Malacca straits important as well as most crucial for the world’s shipping is the fact that this is the only practical opening for any sea faring ship sailing from South China Sea to the Indian Ocean or vice versa. About 50000 ships cross this narrow strip of Sea every year. I read somewhere, that each and every day 15 million barrels of crude oil is transported through the straits. 70% of the oil that China consumes every year passes through here. If due to some reasons, the straits are closed to shipping, half of world’s shipping fleet would be forced to divert their sea faring routes. Straits of Malacca actually connect the Andaman Sea on the west to the South China Sea near Singapore. It is a true bottle-Neck of the world. With such crucial kind of geographical location, it is no wonder that the Malacca port has always been an important trading center from ancient times. Modern history of Malacca can be considered from 1400 A.D. When Parameshwara, the then Hindu Rajah of Singapura, was ousted from his throne. He moved northwards and established for himself a new seat of power in Malacca. At that time the entire population of this new state also followed the Hindu religion just like the new King. The King Parameshwara, however fell in love with a Muslim girl and to be able to marry her, adopted Islam and took a new name as Iskander Shah. Soon after this, his subjects also converted to Islam. The state of Malacca became and was henceforth known as Sultanate of Malacca. A family tree of Malacca Sultans over next hundred years, established and extended their Sultanate as a major power on the Malaysian Peninsula. As a result, the port city of Malacca, which also was the capital, really grew in wealth and importance. Traders from China, India, Arab traders from Arabia settled in the city along with local Malay traders. Trade in spices, Tin , silk, Ceramic pottery , Gold and wines boomed and brought great prosperity to the city. The original palace of the Malacca Sultans was located near the harbour. Subsequently, when the European colonizers defeated the Sultan, this palace was completely destroyed by them. In 1984, Malaysian Government and the state government of Malacca decided to re build the palace as per original plans. I am now on my way to see this replica palace, built exactly like the old palace. The villages or hamlets in Malaysia are called Campongs or Campungs. The individual houses in a Campong have a very peculiar construction. The houses are built on wooden stilts or piles well above the ground. It is easily possible to walk below such a house. Sultan’ s palace appears to me like a bunch of such Campong houses on stilts, connected side wise to form a long row. There is a stair case at the center, which leads a visitor to the first floor or further to a flight of steps, leading to the second floor. The palace, constructed entirely from wood, appears to me as very comfortable and most suitable for the weather here. I climb the steps and find in the interior, a very informative museum of history dealing with Sultanate period of Malacca history. The inner halls of the palace display huge show cases which are esthetically arranged and are loaded with artifacts, old coins, jewels, ceramic pottery and period furniture. 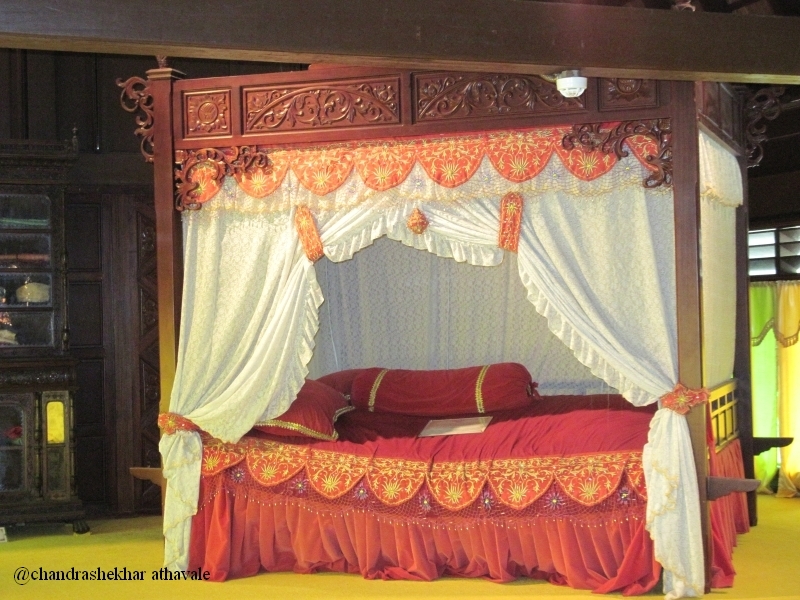 The outer verandahs, have series of stalls with scores of mannequins arranged to display general attire of various traders and communities living in Malacca during Sultan era. A mock display of Sultan’s court is very popular with droves of school boys and Tudung(Headscarf) wearing school girls. I remember with a saddened heart, the general apathy shown towards historical objects in India. Compared to that , this way of projecting history of your country to school children seems to be the right way. 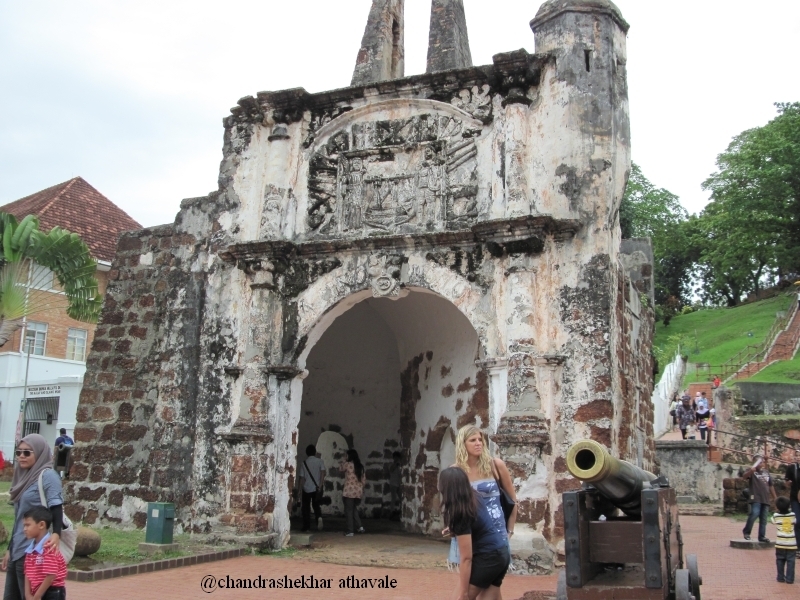 Lured by the wealth of Malacca port and importance of its geographical location, Portuguese navy invaded the port in early sixteenth century, defeated the Sulatan’s army and drove him away to Bintan. 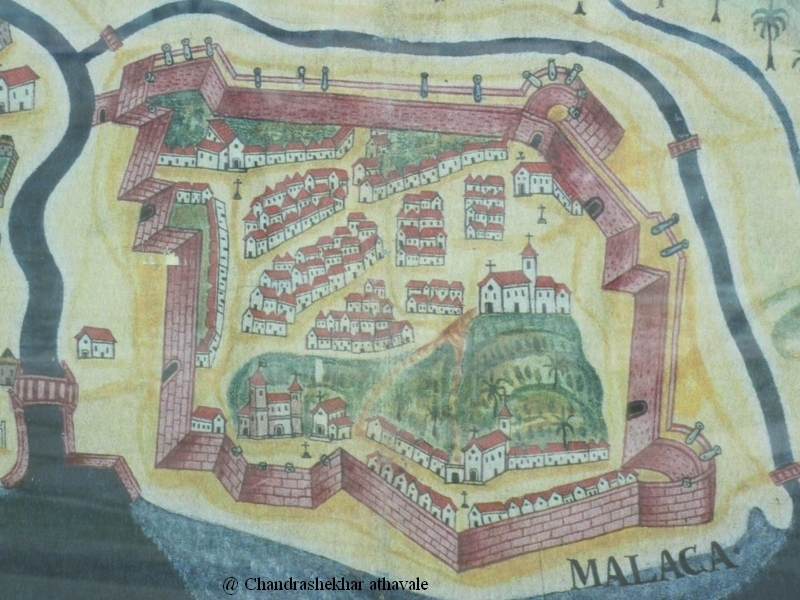 After the take over, Portuguese tried to establish their control over Malacca by building a strong citadel near the harbour. The British on their part, destroyed this bastion completely, except for the a small part of its entrance, which was retained by the orders of then Viceroy of India. I am now walking over to this ruin, located just by the side of the Sultan palace. The place is known as Porta d’Santiago and is really just a piece of wall with an arched entrance. The ruin is being maintained very nicely with a patch of lawn around and a big brass gun standing near the gate. A small hillock stands just behind Porta d’santiago. I learn that there are some ruins from sixteenth century of a church on the top. I am not much inclined to climb the hill just to watch ruins of some old church. However, watching the hill from the foot path at the bottom, leading up to the top, I suddenly realize that I may be able to have an uninterrupted view of the sea coast from the hillock. The thought enthuses me and I start climbing the hill. My efforts are well rewarded when I find a beautiful and uninterrupted view of the long strip of sea, lying along the coastline. So, this is the famous Malacca straits, about which I have been reading not only in history books but also in innumerable articles about international geopolitical strategies and politics. I can see on the horizon almost an unbroken line of sea faring vessels treading along the straits, showing heavy density of traffic. I Climb down the hill from the other side, which immediately leads me to a well maintained old building, painted in a soothing shade of red. This red building, which I saw from the top of the hill, leads me further to few more red painted buildings. This is the old town square of Malacca also known as Stadthuys. In the year 1641, the Dutch naval ships invaded Malacca again and fought with the Portuguese, already established here, and defeated them. For next 180 years they managed to control this port and the trade through it. 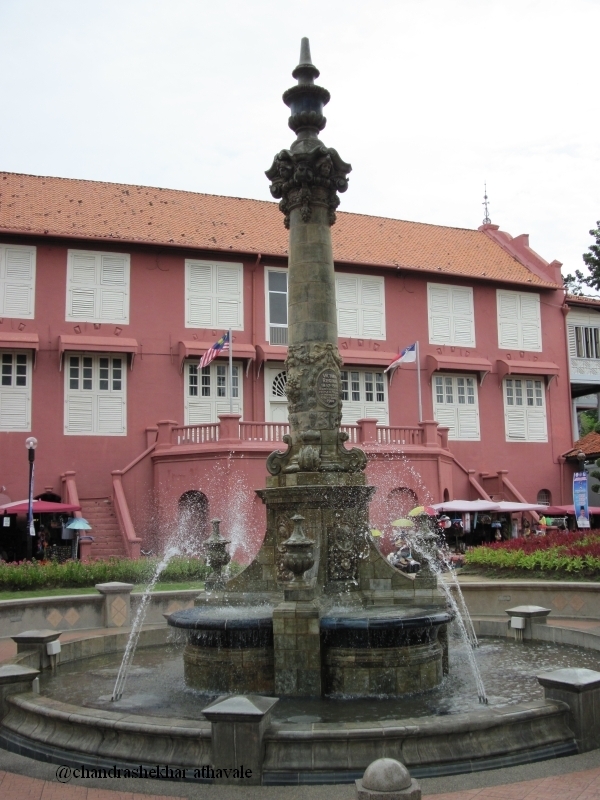 The Dutch authorities constructed the red town square except for a nice little fountain in the middle, which was constructed by the British later, when they took possession of the port in exchange for some areas on the Sumatra island, across the straits. What ever may be the history, the town square looks rather cute to me with those nice red coloured buildings, a fountain and a pleasing ornamentation of a few colourful and well decorated Trishaws (A cycle Rikshaw with a sidecar type arrangement for carrying passengers) with plastic flowers and lights, crowding the space in between the red buildings. On the other side of the fountain, I see an extremely busy road with traffic again moving in only one way and lessening the traffic jams. I cross this road. On the other side, there is a river flowing with abundant water. This looks very similar to something one sees in any town in Europe. I walk along the river. I see ahead of me, ruins of the ramparts of a Fort built by the Dutch for protection of the town. The ruins have been well preserved and maintained. A path way further, leads me to a water wheel, built by one of the Sultans, to lift water from the river for use of the inhabitants. Entire riverside is stunningly picturesque. No visit to Malacca can be complete without a visit to a small street called Jonker street. I cross the river on a bridge and there is this street with rows of shops selling antiques, pictures, nicknacks and Malay goodies to savour. I enter the street with determination not to fall prey to any tempting offers. It is of not much use and I end up buying some quite unnecessary and irrelevant stuff. The entire town square area is loaded with museums of all kinds including a museum of Kites and Butterflies. I decide to restrict myself to visit just 3 or 4 from these. The museum in the red town square building is perhaps one of the best. As I enter inside, I realize that even though, the building appeared to have a modest dimensions from outside, it has huge and well spread interiors. 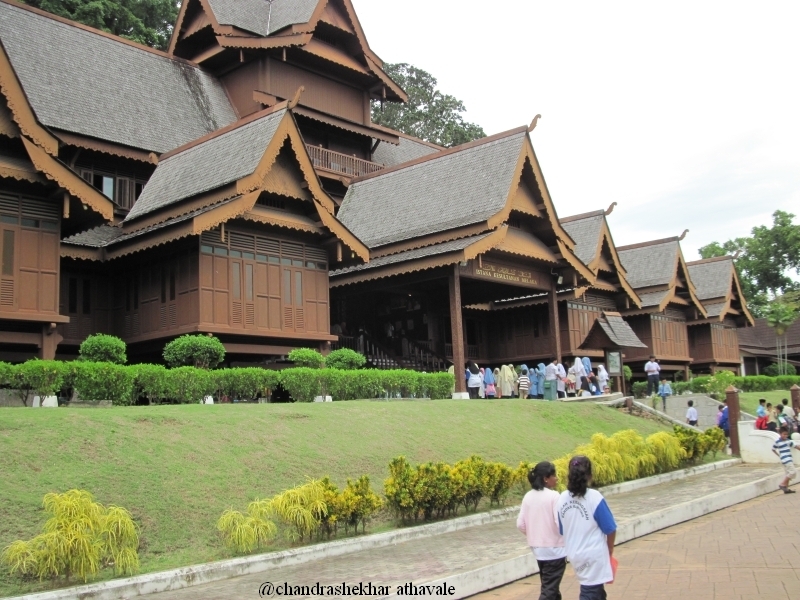 This museum displays the colonial history of Malacca. There are arms of almost every type. Cannons, guns, swords, pistols all displayed in show cases. Statues of Dutch and British Admirals. 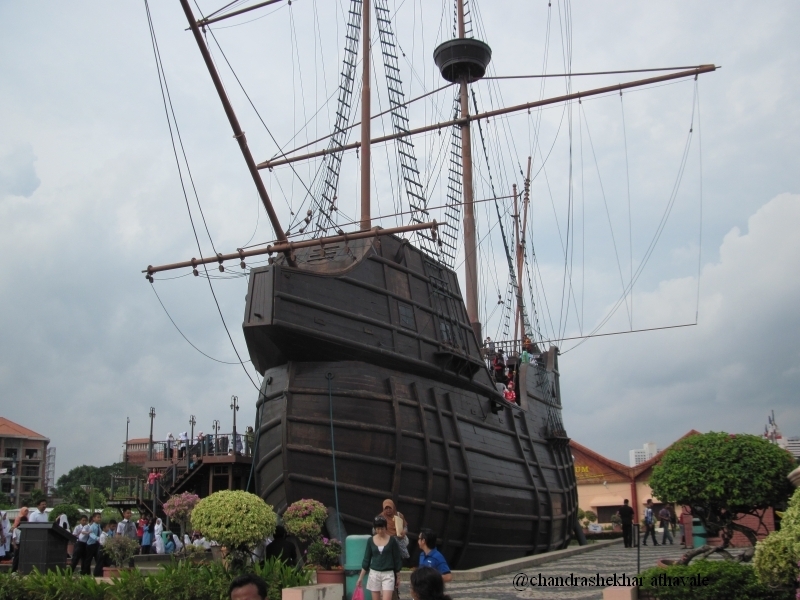 Models of the Malacca fort, old pictures, models of old ships, the collection is huge. The coins used by traders of different communities are displayed. It appears that coins of any nation around, India, Arab lands, Dutch coins and off course Sultan’s own coins, everything was accepted here in trade. There must have been a real money exchange here. As a final, I decide to visit the Maritime museum, which turns out to be a disappointment. Much better exhibits are available for viewing in Mumbai museums back home. A full scale replica of a Portuguese ship ‘ Flor de La Mar ‘ turns out to be an interesting exhibit. This ship was sunk in Malacca harbour. A replica from the original construction plans, was built in 1990. This replica ship is very popular with school kids and I find myself stuffed out. Malaysian government is making lot effort to make Malacca a tourist destination. The thoroughly enjoyable river cruise and the mono rail ride are some of the things I can see. Its dinner time and I am off to a restaurant that specializes with ethnic Chinese dishes. Chinese labourers came to Malaysia to work in the Tin mines and rubber plantations. Eventually they settled down here and formed a major part of the population. These Malay Chinese are known by the name Nonya-Baba or Baba-Nonya. They brought to Malaysia, their own culture and culinary expertise. Their food is known here as Nonya food. The restaurant is crowded not only with ethnic Chinese but with some Caucasians and Asians like me. The food, even though based on noodles, rice, chicken and prawn dishes, has a distinct taste and flavour. I finish off the dinner with Cendal, a Nonya desert made from frozen coconut milk, red beans noodles and sugar syrup. Tomorrow we go back to Singapore. Memories of Malacca stay with me.